In the morning we leave Athens and drive towards Delphi. On the way, visit of the monastery of Saint Lukas (Hosios Loukas) in Boeotia, with its beautiful mosaics. 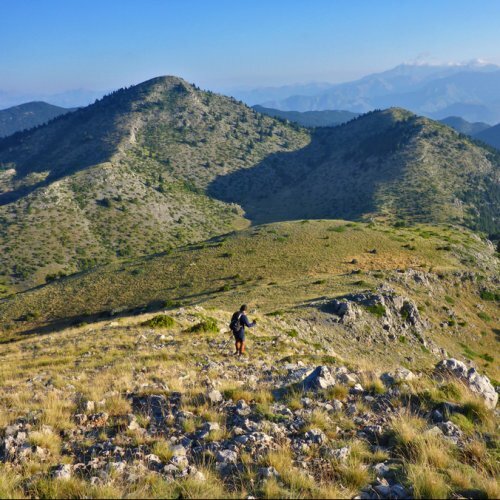 Hiking along the slopes of Mount Parnassos, to the Corycian Cave, dedicated to the cult of Pan and the Nymphs. 1 overnight in Delphi. Delphi is lovely provincial town, built on the slopes of Mount Parnassos, over the plain of Amphissa and the Corinthian Gulf. 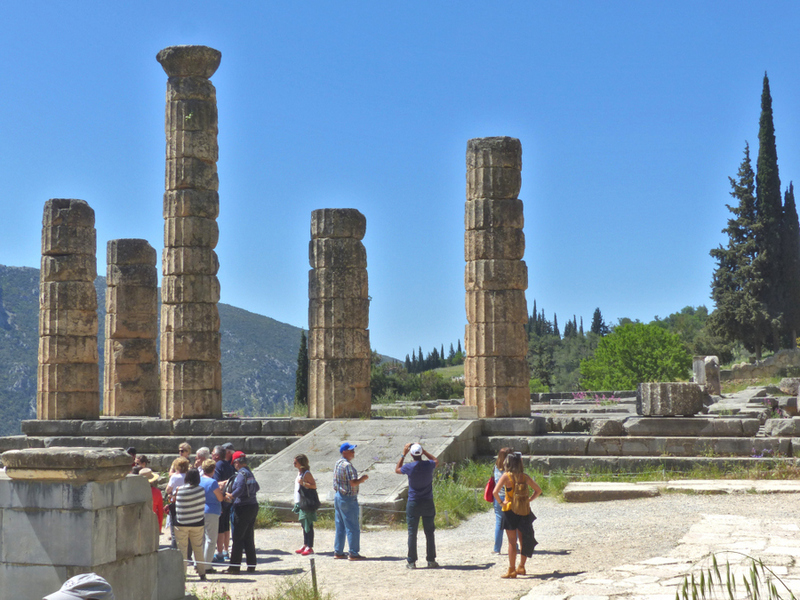 Known for Apollo’s oracle and Pythia’s prophecies, Delphi was during Antiquity the “navel of the world”. 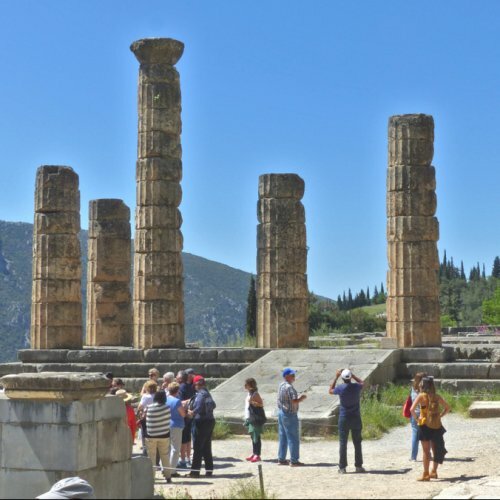 The hike of the day is an archeological walk on the Sacred Way through the shrines of ancient gods towards the theater of Delphi and the stadium of the Pythic Games. We will visit the archeological museum with the famous bronze Charioteer, sculptures of Siphnos treasure, colossal statues of kouroi from Argos and the remains of three gold and ivory statues. Lunch pause and departure to the Peloponnese. 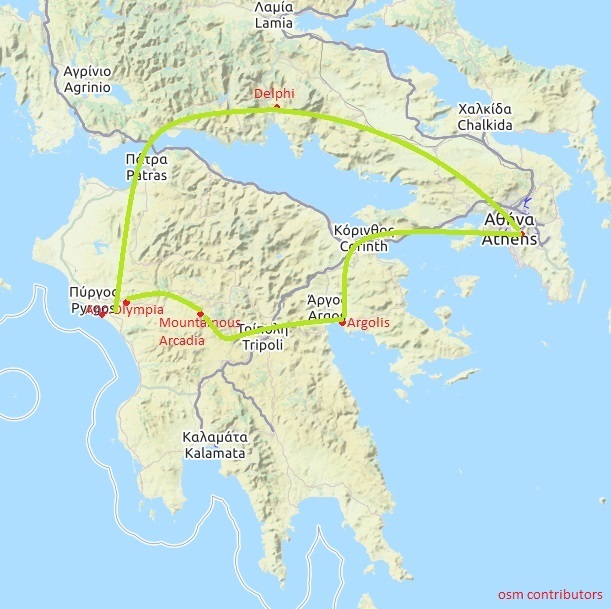 We take the coastal road along the Corinthian Gulf, we cross the Rio-Antirrio straights and we arrive to Olympia. Diner and 1 overnight. In Olympia since 776 b. J.-C. and for over a millennium, the Olympic Games had been organized there every four years until the day when the Byzantine Christian Emperors had decided to ban them because of their pagan character. It took 1500 years for the organization of the first modern Olympic Games, in 1896. We will visit Zeus’s sanctuary with its temples, its stadium and the palestra. In the museum we will discover the sculptures from Zeus’s temple, the victory (Nike) of Paionios and Hermes of Praxiteles. Departure for Arcadia. We take the mountain road through wild landscapes and abandoned villages. 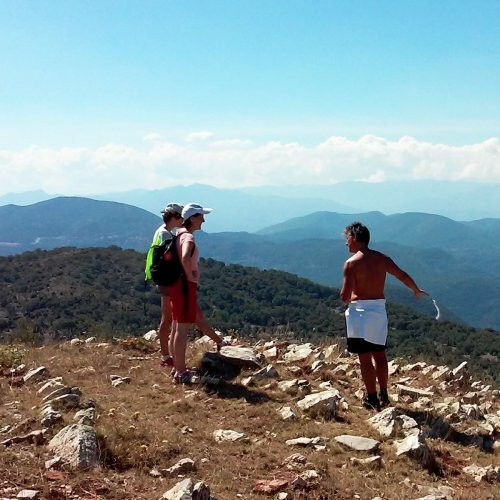 Circular hike from the picturesque village of Dimitra to the old arc Bridge of Ladon River. Diner and 2 overnights in Vitina. 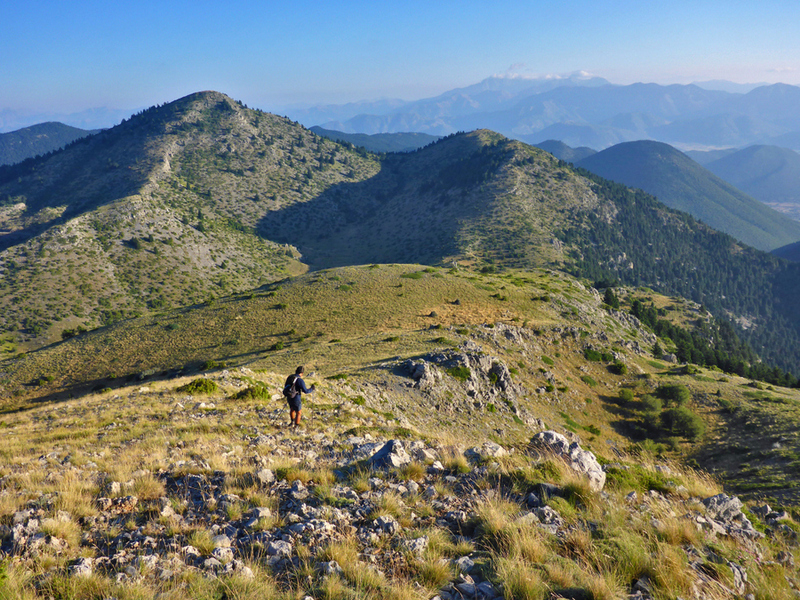 Hiking through the gorge of Lousios River, from Stemnitsa to Dimitsana; the "stone jewels" of Arcadia with their stone mansions and stone paved paths, in perfect harmony with the beautiful lush landscape; passing by the monastery of Prodromos and Philosophou (the "Philosopher’s"); both "hanging" on the rocky cliffs. Return to Vitina. 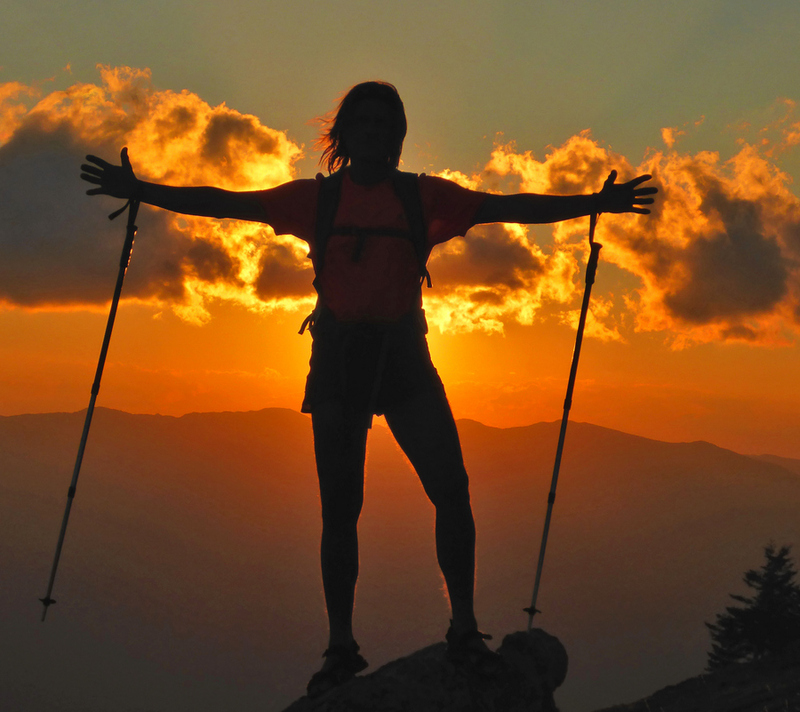 Transfer to the hut of the alpine club of Tripolis, at 1600m, on Mount Mainalon. 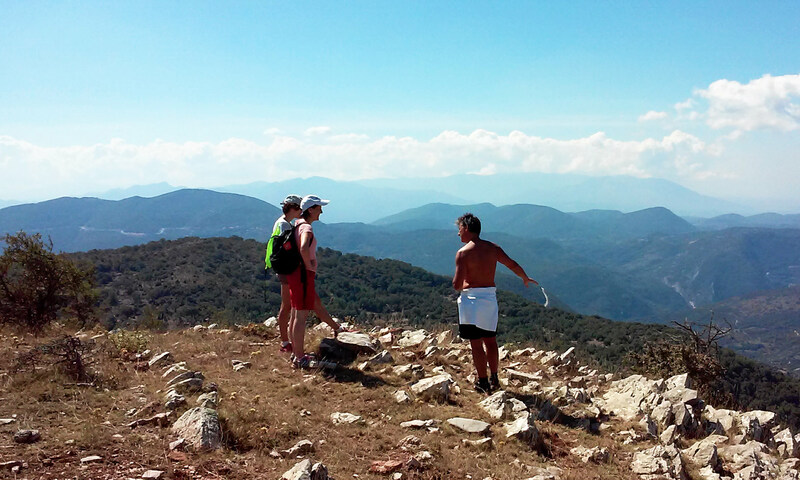 We hike to the pick of Ostrakina, 1981m and back by the same or via an alternative path. 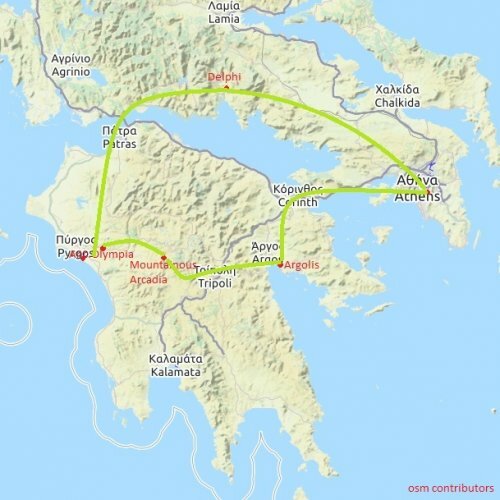 Departure to Argolis and Mycenae, homeland of Agamemnon, the military chef of Greeks during the Trojan War. We will visit the acropolis with the famous Lion Gate, the Cyclopean Walls and the Domed Tombs. Diner and overnight in Nafplion or Tolo, on the gulf of Argos. Day 6: Argolis- Epidaurus and Nafplio. Farewell! During the Antiquity, pilgrims were arriving to Epidaurus from the entire Greece, in order to find cure in the sanctuary of Asclepius, the healing god. The ancient theatre of Epidaurus is famous due to its acoustics. Nafplio, the first capital of the Modern Greek state, is a picturesque old city that preserves its Venetian and neoclassical character. We will walk around the Acronafplia and below of Palamidi forteress towards the beach of Karathona forth and back. In the evening, this beautiful adventure ends. 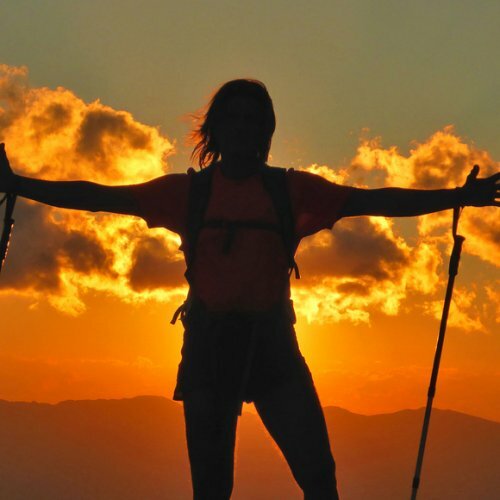 Return to Athens or prolong your stay in Nafplio or next experience.